Wednesday Sept. 26, 2018, Milverton, ON: The 2018 NASCAR Pinty’s Series is set to come to a conclusion this Saturday with the 13th and final event of the season taking place at Jukasa Motor Speedway. The Pinty’s Fall Brawl should be an exciting race with lots of action as the championship contenders battle it out for the 2018 crown. 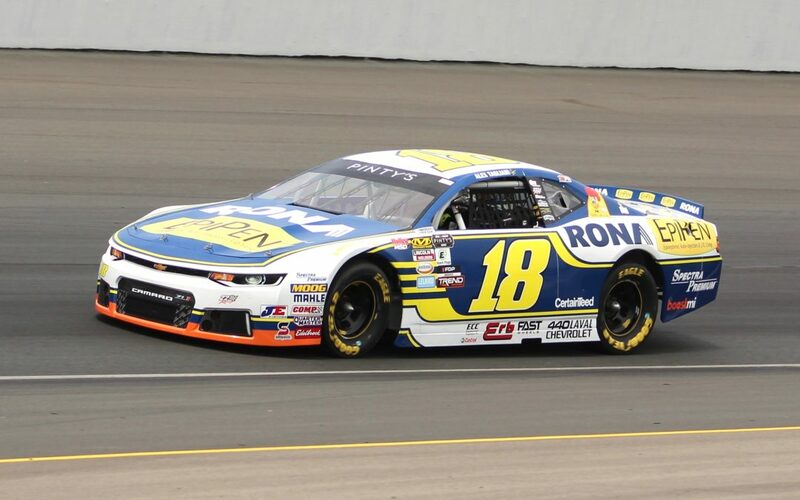 One of those contenders is 22 Racing’s Alex Tagliani driver of the #18 EpiPen/Rona/St. Huberts Chevrolet Camaro ZL1. Tagliani finds himself just four points back of the leader L.P Dumoulin going into this final 200-lap event. Tagliani has been making steady points gains on the leaders since the half way point of the season posting five top five finishes and two wins. Marc-Antoine Camirand driver of the #22 GM Paille Chevrolet Camaro ZL1 is coming off a disappointing finish at New Hampshire Motor Speedway where he ran in second for the last half of the 100-lap race but ran out of fuel coming for the white flag. Camirand still has lots of momentum going into this race though after posting his first series win two races ago at St. Eustache and then running up front at NHMS. Donald Theetge driver of the #24 Mercedes-Benz/Circuit Acura Chevrolet Camaro ZL1 came close to winning this race in 2017 losing out on the last corner of the last lap when a bump and run moved him back to second. And while running in top three in the earlier race at Jukasa this year, he cut a tire and hit the wall ending his day. He feels this track owes him one, so he will be looking for the podium at the end of the 200-lap event. The Pinty’s Fall Brawl takes place this Saturday Sept. 29th at Jukasa Motor Speedway. Grandstands open at noon, NASCAR Pinty’s Series practice is at 12:50 p.m. New at this event, NASCAR are inviting fans to join them for the Driver, Crew Chief & Spotters meeting at 3:15 p.m. which will be held in the grandstands. Next up be qualifying at 4:00 p.m. with the on-track autograph session at 6:15 p.m. followed by the green flag on the Pinty’s Fall Brawl at 7:35 p.m.
About 22 Racing: 22 Racing is owned by 4X NASCAR Pinty’s Series Champion Scott Steckly and is based out of Milverton Ontario in a new (2014) 7,500 square foot race shop. In 2018 they field three full time teams in the NASCAR Pinty’s Series with drivers Alex Tagliani, Marc-Antoine Camirand and Donald Theetge. They have prepared and entered cars for drivers such as Christopher Bell, Jacques Villeneuve, James Buescher, Jeb Burton, Kaz Grala, L.P. Dumoulin, Max Papis and many others. 22 Racing provides turnkey solutions for drivers looking to compete in the NASCAR Pinty’s Series. The 22 Racing Team is supported by the following sponsors: Erb Group of Companies, AW Millwrights, Engineered Components Company, Castrol, Wendell Motors, Auto Glym, Mechanix Wear, Great Dane Glasvan, Safety Kleen, Wilride Transport, Lincoln Electric, Permatex & Dickies.